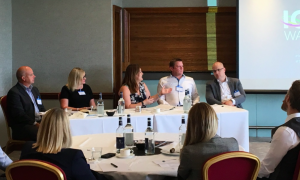 This morning the 4th July 2018 Ross Weir Managing Director of HJ Weir was asked to be part of a panel event at the Celtic Manor with ICC Wales. Joined by a few key South Wales Chamber members to discuss supply chain opportunities and how smaller businesses have broken into the bigger tenders. Following an initial presentation from ICC Wales the Chamber of Commerce co-ordinated a panel of speakers from various backgrounds that could share their experiences. Ross Weir was joined by some great names in business from across Wales including : Richard Selby from Pro Steel Engineering, Danielle Bounds from ICC Wales and Paul Armstrong from SISK.